You are here: Home / Gift Guide / Holiday 2012 / KitchenKuffs – Keep Your Sleeves Up ! 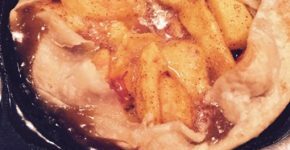 KitchenKuffs – Keep Your Sleeves Up ! I just received my pair of KitchenKuffs to review for our Holiday Gift Guide and I can’t say enough good things about these! What a great idea!! (These are in that category of “Why didn’t I think of that??) KitchenKuffs are the brainchild of Barbara Doran. All of us have experienced soggy wet sleeves from dishwashing… or washing the car. 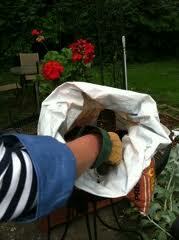 And, don’t forget all of the times your sleeves have gotten in your way when you are flower or herb gardening. And what about cooking? 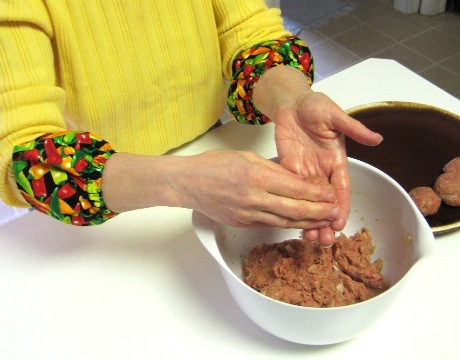 My sleeves are always in my way when I’m kneading bread or making meatballs… but not anymore! 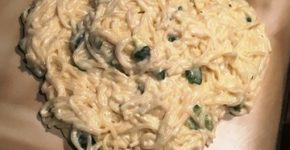 KitchenKuffs to the rescue! I’m going to put a pair under the kitchen sink, a pair in the garage by my potting bench, and a pair in the laundry room. I’m getting ready to paint one of our bathrooms and I’m sure my KitchenKuffs will come to the rescue then too. I just keep finding times when my KitchenKuffs come in handy! KitchenKuffs would make a great stocking stuffer. They come in Regular and Adjustable Sizes and sell for $ 9.95. You can order them here – just in time for holiday gift giving: Order KitchenKuffs Plan on ordering several pairs – for schoolteachers, for dance and piano teachers, grandma, mom, aunts and cousins! Everyone will think they are great! Note: I received a sample of KitchenKuffs for this Holiday Gift Guide review. No compensation was received. These are my true and honest opinions.